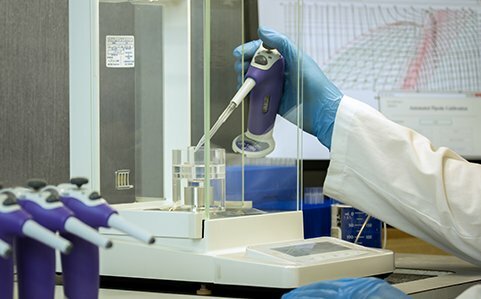 VistaLab Technologies offers a variety of Calibration and Repair services for Ovation and MLA pipettes to meet all regulatory requirements and ensure optimum performance. In order to maintain consistently reliable test results, pipettes should be serviced at least twice per year. With over 40+ years of servicing experience, you can be confident that your pipettes will be performing at their best. All service is performed in compliance with ISO 8655 in our state of the art, ISO/IEC 17025:2005 accredited metrology lab with equipment traceable through NIST to the International System of Units (SI) by expert certified technicians. Choose from our pre-set service options, or request custom tailored service to meet your GLP/GMP requirements. For International Service orders, please use the International Service Order Form below. For customized service options, contact Technical Support. Repair service can be added to any of our Calibration services for a flat fee (determined by pipette model) that covers labor, handling and basic replacement parts (nozzles, filters, keypads, etc). Any required parts not covered (PCB’s, motors, piston assemblies, etc) will be added to the overall service charge. We will contact customers of any added charges and only move forward with repairs once approval is received. All repairs are done using Original Manufacturer’s parts. Other calibration labs may use generic parts which can affect performance and require more frequent maintenance. VistaLab repair service also covers replacement of uncommon wear parts as standard procedure. Customers can request repair reports by contacting Technical Support. For calibration discrepancies, pipettes can be sent back (at customers expense) inspected and have calibration verified. How often should I calibrate my pipettes? As the manufacturer of MLA and Ovation pipettes, VistaLab recommends performing routine maintenance and calibration verification on pipettes at least once every 6-12 months (depending on how often they are used and what they are used with). Required maintenance and calibration intervals are determined by your labs’ internal quality/ regulatory system. Customers should always first consult with their quality department. What is the difference between As-Found and As-Left data? Preventative Maintenance is the cleaning and lubricating of plunger and pistons followed by the replacement of normal ‘wear’ parts- including, but not limited to, O-rings, seals, nozzles and filters. Can I use another brand of pipette tips when calibrating? While there may be other brands of tips that fit with Ovation and MLA pipettes, they are factory calibrated with VistaLab brand tips. Different brand tips have different dimensions and geometries, so performance will vary from tip to tip. If pipettes are used with another brand tips, customer should adjust pipettes’ calibration according to the procedure described in the models’ corresponding Operators Manual. Can I adjust my pipettes' calibration in my lab? Yes. MLA and Ovation pipettes can be adjusted in the lab to linearly increase or decrease volume delivery to adapt to different laboratory testing conditions. Refer to A) Performance Verification document fo MLA. (link to PDF) B) Performance Verification document fo Ovation. (link to PDF) We recommend replacing piston seals and lubricating before any calibration adjustments are made. What brands of pipettes do you calibrate? We only calibrate VistaLab MLA and Ovation pipettes..
What is the turnaround time for Calibration? Typically 48 – 72 hours (not including shipping time). Rush service available for an additional charge. What volume do I use to calibrate my pipette? MLA and Ovation pipettes leave the factory calibrated at their published specs, or 100%, 50% and 10% of maximum value. For frequently used volumes that are not published, it is the discretion of the customer to adjust for that volume. Refer to pipette Specifications.